These are wonderfully Spanish – rich in garlic and sherry flavours – and easy peasy and quick to cook too. 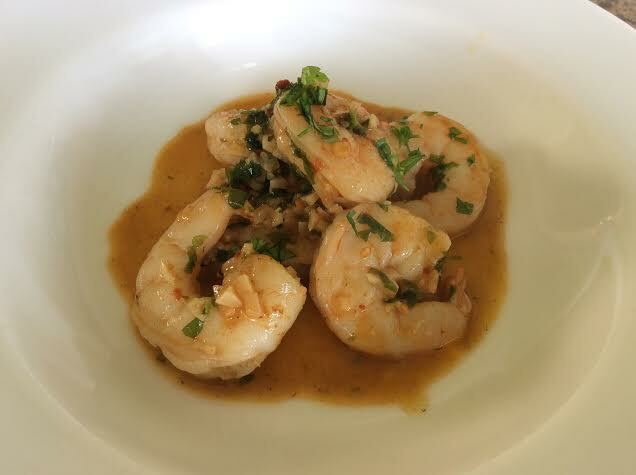 I use frozen raw king prawns which I get from Ashtons and keep in the freezer for curries and suchlike. They work really well, although they aren’t quite as pretty as whole prawns with the tails on. The flavour’s the most important part though, and these are full of it. Place the oil, garlic, chilli and paprika in a large frying pan. Heat to a medium heat until the garlic becomes fragrant, then increase the heat. (Take care not to burn the garlic, it will become bitter). Add the prawns and cook, stirring, for 2 to 3 minutes or until they begin to turn pink. Add sherry and cook for 1 minute or until the prawns are cooked through. Remove from the heat and sprinkle with the parsley. Serve with plenty of crusty bread to mop up the wonderful juices.